Looking to build and market a successful store with an e-commerce company? Or perhaps you represent a nonprofit with an e-commerce store that is trying to makes a difference in the world? Volusion might be the solution that answers your needs. In this article, we’ll look into what you need to know to decide if Volusion is right for you and, if it is, how to set up a successful online store. More than 40,000 business owners from a range of industries have already used Volusion. Volusion’s store showcase lists clients from the health, beauty, food, sports, outdoor, apparel, home, garden, auto, industrial, and electronics industries. An additional industry category, “hobby”, includes stores that focus on pets, boats and wax writing accessories, among others. 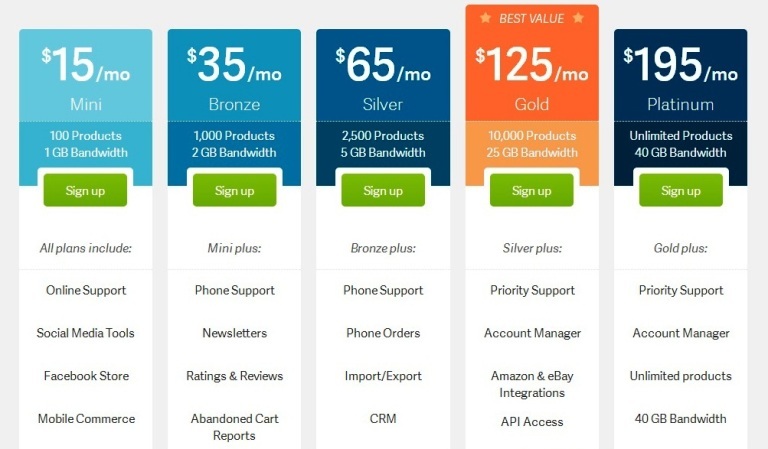 Volusion offers five pricing plans, plus an enterprise solution. All plans come with no transaction fees and include 24/7 online support, social media tools, automatic tax rates, a Facebook store, and a mobile store. However, plans vary by how many products you can sell as well as how much bandwidth and how many features you get. The Mini Plan offers everything detailed above, 1 GB bandwidth and the ability to sell up to 100 products. It costs $15 a month. The Bronze Plan adds to that. It lets you send newsletters and lets customers rate your products. (Ratings will appear in Google searches.) Plus, you’ll be able to see which clients abandoned carts before making a payment and contact them to improve your revenue. The Bronze Plan gives you 2 GB bandwidth and the ability to sell 1,000 products. It costs $35 a month. The Silver Plan gives you everything the bronze plan does, plus the option to sell to customers via phone, and to import and export products and data to and from your store. In addition, you’ll get a customer relations management (CRM) tool to gain insights about your customers and interact with them in a more efficient way. The Silver Plan gives you 5 GB bandwidth and the ability to sell 2,500 products. It costs $65 a month. The Gold and Platinum plans offer the same features as the Silver Plan, plus more: they offer integration with eBay and Amazon, let you offer “deal of the day” promos and a customer loyalty program, allow you to add third-party applications or create your own, and batch order processing. In addition, both Gold and Platinum plans come with an account manager. The account manager will provide you with a preliminary coaching session and will stay on to support you with any Volusion-related challenge. You’ll also be able to cut regular phone lines and get support faster. The Gold Plan gives you 25 GB bandwidth and the ability to sell 10,000 products. It costs $125 a month. The Platinum Plan costs $195 a month. It gives you 40 GB bandwidth and the ability to sell an unlimited line of products. Volusion offers an additional platform called Mozu, that’s dedicated to offering e-commerce solutions at an enterprise scale. Mozu enables you to create and share extensive catalogs, supply multiple payment and shipping options, design your store to fit your brand, improve SEO, manage customer relations, and offer promotions. Since the enterprise solution is offered on its own website, the rest of this article will refer to Volusion’s non-enterprise plans. 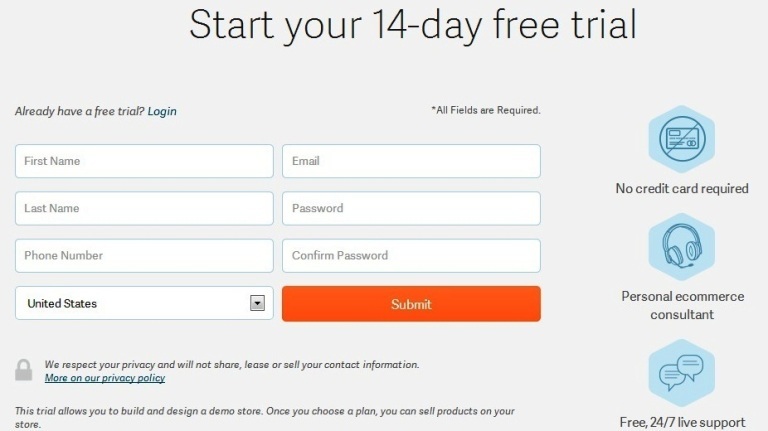 Volusion allows you to try part of their services for free for the first 14 days. You won’t be able to sell products until you make a payment, yet you’ll be able to get a feel for the platform. No credit card is required in order to open a demo store, and you’ll be entitled to 24/7 support nonetheless. To sign up for the free trial, you’ll need to enter some basic information, including your name, email, and phone number. Save the welcome message you’ll receive from Volusion, as it will include a link to your dashboard, also called here “your store administration page”. Click the link in the message to arrive at your new Volusion storefront. Then, click the “Quick Start” button on the left bottom side of the page to get started. Design: You’ll be able to choose from nine featured templates or opt for the 10th option, which will take you to your full dashboard and expose you to 318 themes. Personalize: Add your store’s name and logo. Add a product: Insert your product’s name and price; then write a description. For a bigger impact, add an image. You can choose from 10 sample images, but it’s best to upload an image of your real product. When customers visit online stores, they expect to see the actual products they’ll be buying featured there. Click the green “create product” button, and the product will be added to your store. You can repeat the process here or move on to the more convenient dashboard. The dashboard is your store administration platform. 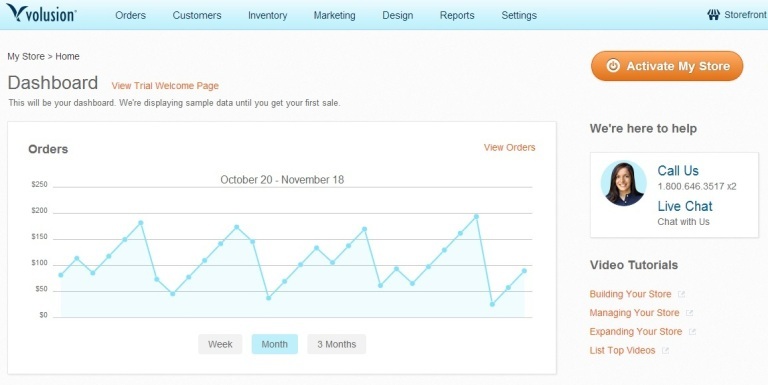 Here, you’ll be able to view a graph of customers’ orders from your store in the past week, month, and three months. You’ll also be able to see what are the top 5 products, top 5 categories, and top trends in your store. Orders: Process orders and returns, and help customers shop via phone. 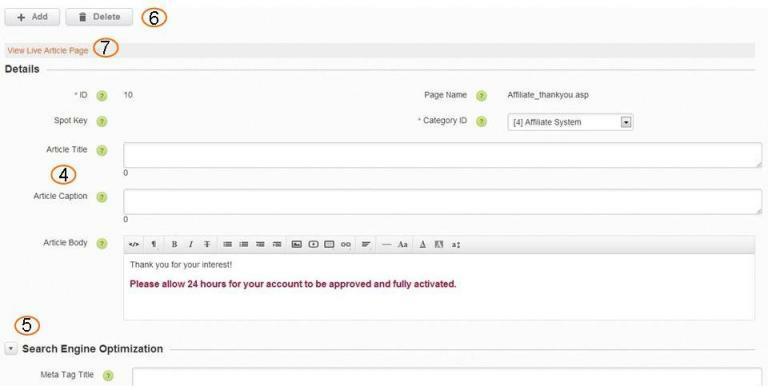 Customers: View and manage administrators’ access, customers’ information, order history and product reviews. Inventory: Manage vendors, suppliers, warehouses, products and orders. 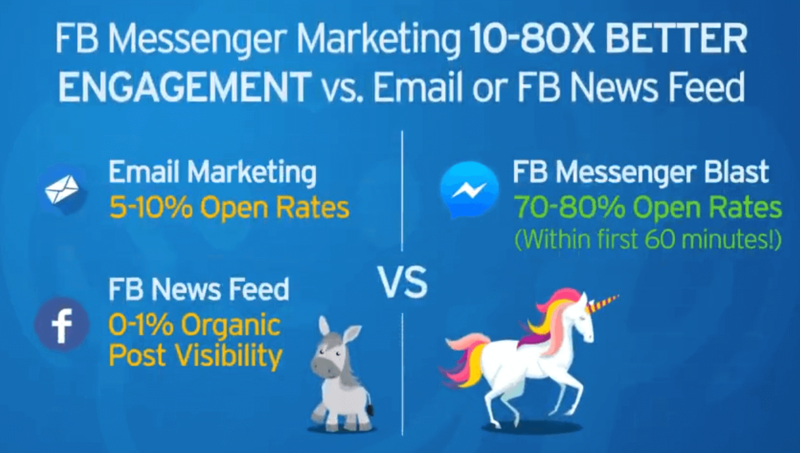 Marketing: Enable sales on Facebook, eBay, and Amazon; link your Facebook and Twitter accounts to your store; create coupons and discounts; create rewards and gift certificates; optimize your store for search engines; build and manage an affiliate network; and give customers updates when popular products are back in stock. Design: Choose your template and logo, enable a mobile site, and manage content and product display settings. Reports: Create and edit reports, start promotional campaigns and track their ROI, view revenue generated from affiliates and discover which terms people search on your site. Settings: Add company information, choose shipping destinations, integrate with global shipping carriers, manage your taxes, set up customers’ payment options, enable customers to see rates in their local currencies if you sell to more than one country, add fields customers need to fill when purchasing items, temporarily close your store for maintenance, and configure a variety of other options. In the following sections, we’ll take you though the most important steps to follow in order to get started with your Volusion store. Throughout the process of setting up your store, you’ll be able to see a demo site by clicking the “storefront” button at the top right side of your dashboard. 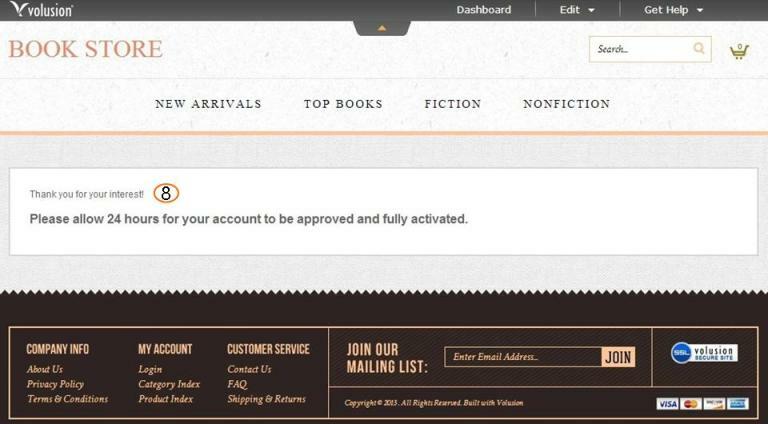 If you choose to start with the free trial, you’ll see an orange button below it, offering you to activate your store. Clicking on that button will lead you to select one of the pricing plans covered above, so you can start selling. However, if you’re not ready to buy yet, you can still use the “storefront” button to see how your store will look like once it goes live. We live in a visual world, so how your store looks like will have a big impact on whether customers stay long enough to do some shopping. Choose the “template” option under “design” in your dashboard to be taken to Volusion’s full gallery of store themes. Here, you’ll be able to choose from 318 options. You can filter themes by color, category, industry, and price. 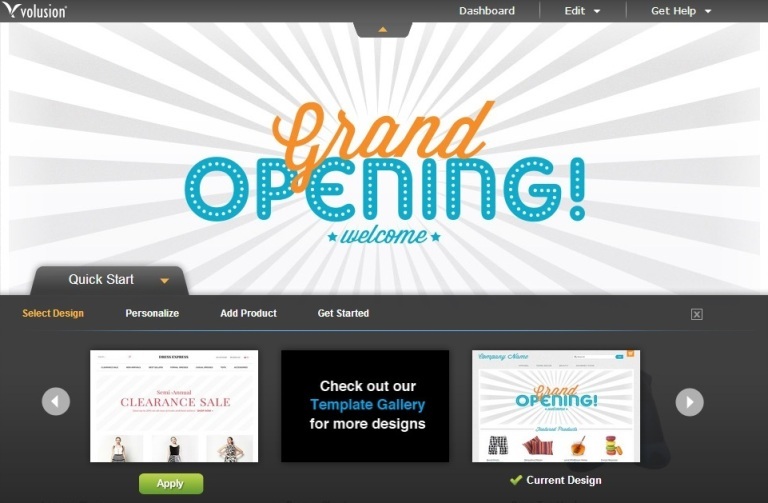 Store themes range from free to $895 per theme. Hover over one of them with your cursor and you’ll be able to see a larger preview. Clicking on a thumbnail will lead you to a page with more information and a couple more thumbnails of this theme. Some theme previews offer a live demo for your convenience. Once you choose a theme, click on “Get It”. It will be saved in the “Saved Templates” category, available at the top of the page — right below the big “Templates” headline. Go to “Saved Templates” and click on the “activate” button next to your desired theme. Branding your store is important. Choose the “Logos” option under “Design” from the top navigation bar to upload your logo’s image. If you don’t have a graphic yet, choose the text option and simply write your store’s name. You can add a logo text or image to your website store, mobile store, invoices clients receive, and even your favicon — that tiny image that appears to the left of your browser’s address bar. With so many people browsing online on their phones, enabling a mobile store is crucial if you don’t want to lose large numbers of prospective customers. Volusion offers you the option to use their selected mobile theme, or edit the code to fit your needs. You can find the “Mobile” option under the “Design” tab in the top navigation menu. When you choose the “Site Content” option under “Design” and see the table of page extension next to texts, you might be startled at first. It’s not the most comfortable way to display content, yet Volusion does separate categories of pages with orange headlines. In addition, page extensions give you a clear understanding of what the page is about once you get used to them. For example, once potential affiliates ask to sign up to your program, they’ll be taken to a thank you page whose URL ends with “Affiliate_thankyou.asp”. The “Affiliate_thankyou.asp” extension appears on the left side of the table on your store dashboard. Look to the right on the same line and you’ll see the text that these potential affiliates will see on this page: “Thank you for your interest! Please allow 24 hours for your account to be approved and fully activated”. 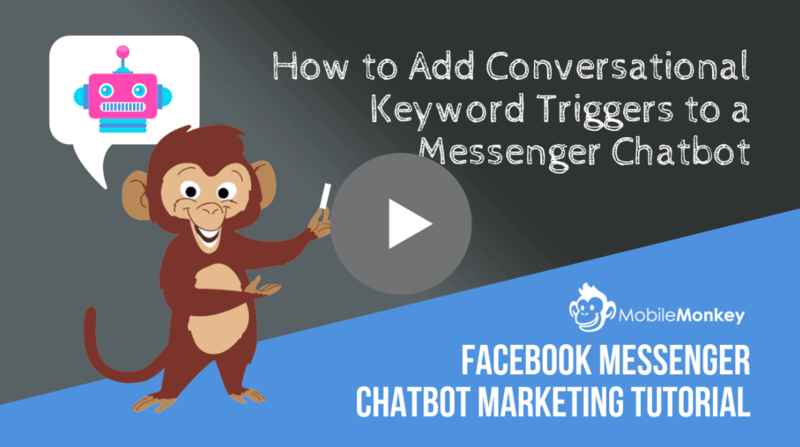 Want to change this text or optimize it for search engines? No problem. Click on the ID number in the far left side of the line. It’s the number that appears at the beginning of each line, i.e., “10” in our example screenshot above. Edit the title and article text. This is where you also take care of the page’s SEO. You can choose to add an additional page or delete this current page. See it in action. Click the “View Live Article Page” button at the top left side of the page (right below the “add” and “delete” buttons). You’ll be taken to your demo site, where you can see how the text will look like once the store goes live. Adjust the text’s font, size, and color on the dashboard until it fits your needs. It’s time to look at the top navigation menu again. Choose “Products” under “Inventory” and you’ll reach Volusion’s sample products page. Delete all this sample info by using the last column of the row, and then add new, real products by using the “add” button at the top left side of the page. Alternatively, click on the orange text in the first, “Product Code”, column and edit a specific product to your own needs. Basic info: Add the product’s name, code, price, weight, and description, plus choose or create categories for the product. You can also use the “options” button to tell customers they can have a chair in one of various colors or sizes, or a cake baked in several different ways. Image management: Upload product photos. When uploading a photo, you can choose “Advanced Settings” to decide on maximum pixel size in different viewing options. I added 10 images to a product page and still had the option to add more. No matter how many photos you add, drag your best one to be the first in order to ensure that it’ll be your featured product image. 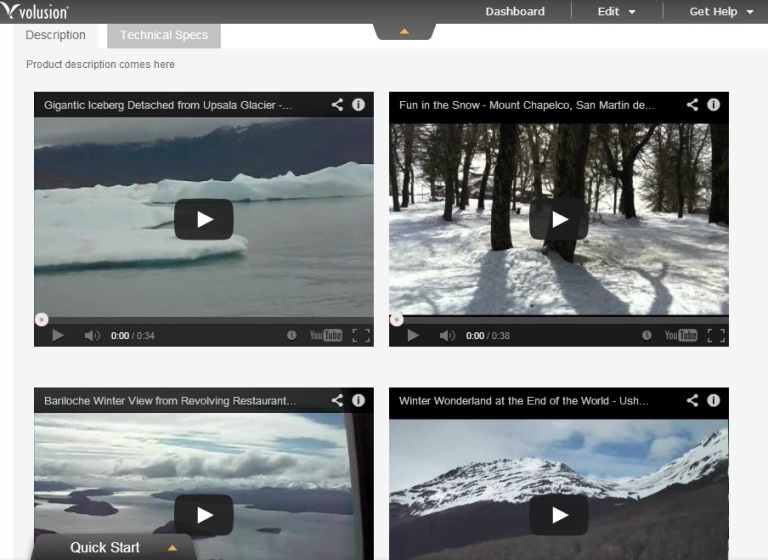 YouTube video management: Click the “Add” button to add links to videos from YouTube that feature your products. You can add up to 4 videos. Like images, videos will appear in the order you set them, so drag and drop until you’re satisfied. Advanced info: This is where you decide, write and edit SEO, pricing, shipping, in-depth product description, product display, third-party integrations, custom fields, recurring pricing, pricing levels and discounts, stock status, vendor information, and more. Inventory control grid: Manage the prices and stock status of child products. Vendor rules: After you set up vendor info in the “Vendors” option under “Inventory” in the top menu, return here and decide what’s the minimum and maximum quantity a vendor can sell — and up to which date. If you have many products to sell, it’s recommended to separate them by categories for easier browsing. You can do that by choosing “Categories” under “Inventory” from the top menu. Choose “Payments” under “Settings” from the top navigation bar. Payment gateway: Configure a payment gateway to ensure a safe credit card transaction. You need to do this to be able to sell online. If you don’t already have a payment gateway, you can get one through Volusion. Card settings: Choose which credit cards your store will accept. Click on “Inactive Cards” for additional options. You’ll also be able to add credit cards that aren’t listed on the page. More payment types: Credit card payments might be the easiest ones, yet this tab enables you to cater to customers who prefer paying in alternative methods, such as PayPal, cash, wire transfer, check by regular mail, etc. You can add additional options to the list. 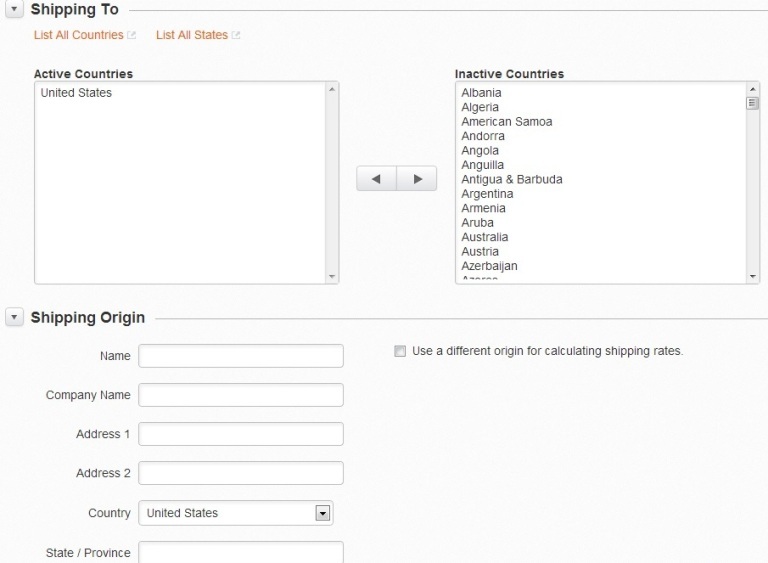 Shipping to: Decide which countries and states you’re willing or able to ship your products to. Shipping origin: Fill out your address so that shipping rates can be calculated, considering your location, while customers check out. Choose a carrier: Choose from FedEx, USPS, UPS, RoyalMail, CanadaPost, DHL, and Australia Post. Most carriers enable you to pick and choose from their list of services. Advanced shipping settings: Choose whether to always add tax to shipping or not (or sometimes), whether extra shipping weight should add to the shipping price, whether customers need to specify if their address is residential or business, and what kind of delivery confirmation, if any, you’d like to receive. Test shipping rate: At the bottom of the shipping page on your Volusion dashboard, you’ll be able to test shipping rates by changing the address, price, and weight. 3 free how-to guides that teach you how to sell online. Online chat: Accessible from your automatic welcome email and from your dashboard’s home page. Your personal Volusion consultant: Once you sign up to Volusion, you’ll receive an additional welcome email, this time from a Volusion representative. If you’ve signed up to the free trial, the representative will give you a call and offer that you upgrade. Even if you’re not into sales calls, having a representative’s direct email address might help you get answers faster. Have you used Volusion for your online store? Share your experience with us in the comments. Thanks for the comment John. No doubt this is valuable feedback Volusion would like to know. Have you made this feedback, and any others, known to them? Doesn’t bring up the fact that there are drop downs in use in Volusion that the customer does not have an option to change to radio buttons. For example, I do not want my shipping options to display as a dropdown, but rather as radio buttons with the free shipping option selected. Unfortunately, there is no way for me to go and change this from a drop down list to a radio selection without paying someone to do it for me. My $.02 — if you found this article too long to be able to read it, you’re unlikely to have the patience and attitude needed to get an ecommerce store up & running 🙂 Personally I loved the depth in this article, and feel it was needed, even for a “beginner’s” guide. Thanks for commenting. It was important for us that the article is thorough, so it can answer as many questions as possible. If you’re signing up for Volusion, just move through the sub-headlines and read the particular one each time, depending on where you are in the process of setting up your store. Hope this helps! Extremely long. I couldn’t make it all the way through. Is there a shorter version?